Mapping from spherical coordinates (Xi) to real coodinates. where . stretch, , and are defined by input. Note that is the minimum angle with the z-axis. Given coordinate in mapped space, return its location in real space. Given coordinate in real space, return its location in the mapped space. Stretching in the r direction. Min r (> 0 avoids singularity there). Normalize the mapped coordinates . Return location in real space of an unnormalized Coord. from mapped space. 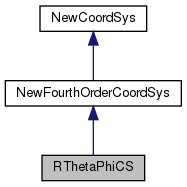 const Real a_phiMin = Pi/4.